The default value is 100ms and the allowed range is 1-65,535ms. This value indicates the frequency interval of the beacon. A beacon is a packet broadcast by the router to synchronize the wireless network. Please note decreasing beacon interval will improve wireless network roaming process and retain wireless connection better but slow down network throughput. For your testing in this case, you can set it to 75 or 50 and check the result later. Default value is 2347 bytes and the allowed range is 0-2347 bytes, only minor change is recommended. If a network packet is smaller than the preset RTS threshold size, the RTS/CTS mechanism will not be activated. The wireless router sends Request to Send (RTS) frames to a particular receiving computer and negotiates the sending of a data frame. After receiving an RTS, the computer responds with a Clear to Send (CTS) frame to acknowledge the right to begin transmission. This feature will prevent packet collisions on wireless network but it slows down network throughput too if used incorrectly. If you have many wireless users located far apart and also far from wireless router/access point, you can then test to decrease this threshold to 2304 bytes and check the result. Default setting is 2346 bytes and the allowed range is 256-2346 bytes. It specifies the maximum size for a packet before data is fragmented into multiple packets. Same as how RTS threshold works, if you notice frequent collisions on wireless network, then can consider to lower the threshold value. Please note that too low or misuse of fragmentation threshold may result in poor network performance too, so only minor change of this value is recommended. For your testing, you can set this threshold to 2304 bytes and then check the result. Overall, you are advised to perform the above tunings one by one and finally all together, so that you can identify the result for each change you made and also make further tuning better. 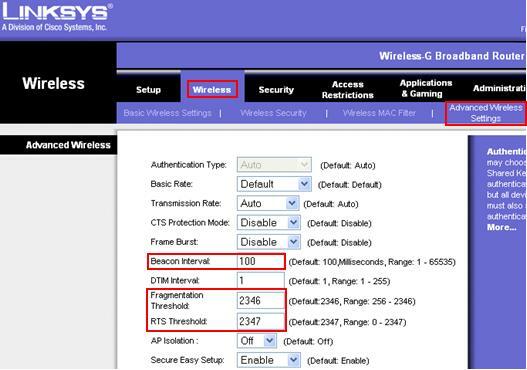 Hope that the above tips can help you to improve wireless network performance. Return to top of "Improving Wireless Network Performance by Tuning Advanced Wireless Settings on Wireless Device"! !